3 MVP Arm Workouts: Build Strength, Add Size, And Get Shredded! Life in the age of ''functional training'' got you down? Reward yourself with some Muscle-Militia-style arm training, and add shape to your shadow where you want it most! Hipsters everywhere worship the '80s these days for a number of reasons, represented first and foremost by the skinny jeans and hairstyles that have inexplicably crawled back out of the crypt 30 years after their initial demise. But in the world of strength, the '80s stand out for a bigger reason: It was when big arms took over! Whether it was Schwarzenegger in "Conan the Barbarian," Stallone epitomizing the snarling badass as he casually fired a belt-fed M-60 from the hip in "Rambo," or Hulk Hogan blowing kids' minds everywhere with his legendary 24-inch pythons, boss biceps and horseshoe-sized triceps remain a signature look of that epoch. Now that's a trend worth reviving! Today, the Twinlab Muscle Militia wants to help you bring back that bygone era from before the dawn of sleeves. To get you there, they've got a three-part plan. You'll start with strength, move on to muscle growth, and finish with the burn of your lifetime. What's wrong with your current arm workout, you ask? Nothing! Except that you've been doing it for so long, you're clinging to it like the hem of your mommy's apron. If you want the kind of arms that have people asking you what changed—or even better, whispering it behind your back in fear—you need to focus and hit them with a new, specialized approach for the next few weeks. But first, here's how not to do it. A lot of guys aim for bigger arms by just chasing a pump all day while counting every calorie. Unfortunately, the sarcoplasm-inflated biceps that result lack the strength to put their size to work—and actually leave some legit size gains on the table, as well. "What's the point of being big if you aren't strong?" ask powerlifting Muscle Militia leader Jason Wheat. You'll start with strength, move on to muscle growth, and finish with the burn of your lifetime. A second bad option: You could bury your snout in the feed trough and go rep loco. You'd end up with massive sewer-pipe-sized stems, but they'd lack definition. "There's a big difference between a big, in-shape arm and just a big arm," says Muscle Militia captain and bodybuilder Ronnie Milo. One more dead end: You could train until your face melts, but skimp on sleep, supps, and recovery, ending up with deflated tubes instead of monster pythons. "That's not the Militia way," says Muscle Militia captain Chris Thompson. "You've gotta have all three—big, strong, and shredded—if you want your physique to really pop." Train arms twice a week. Fit the sessions in either after your regular workout, on a cardio day, or on their own days. Keep eating right and resting plenty. Eat to grow, but not to overflow. Focus on supplements that have been shown to aid in muscle growth, like creatine, BCAAs, and the pump agents in a good pre-workout. If you want one more to put in the stack, try L-carnitine, which may help you lose body fat while retaining lean muscle mass. Follow these workouts to the letter! You can rotate them, but an even better plan is to perform each one for 2-4 weeks before moving to the next. Your first destination on this Tour de Arms is Strongville, population 1: Jason Wheat. The Wheat way for getting strong arms involves a high volume of lifts and a focus on movement speed. "You're going to move with a quicker tempo than when you're training just for mass," he says. "You're focused on moving the most weight as fast as possible to push yourself to the next level of burnout." Wheat believes emphasizing a higher tempo leads to recruiting more muscle fibers and stabilizer muscles. "You're going to really nail the primary targeted muscles, but you're also going to recruit the secondary muscles to just move that weight," he promises. Wheat believes emphasizing a higher tempo leads to recruiting more muscle fibers and stabilizer muscles. For all movements, start with the heaviest weight you can safely handle for six reps, and drop 10 percent of the weight each set. While you might think a hulking lifter like Ronnie Milo goes nuts when he tosses plates in the gym, his number one tip for getting huge arms has nothing to do with poundage. "People want to look cool and throw big weight, so they'll do that at the expense of form. Whether you're curling 65 pounds or 25 pounds, it's all about how you move the weight," he says. "You need to let go of your ego and focus on striving for perfect form with every rep."
And while melon-sized biceps might be head turners, Milo always keeps one basic fact in mind when training for arm size: "Your triceps make up two-thirds of the size of your arms, so you want to give them plenty of attention when striving for size," he says. Here's how he gets big. For each movement, pick a weight that challenges you but that you can handle for a huge volume of sets and reps.
Bottom line: you have to eat plenty of clean protein, cut carbs, and get in some quality fat if you want to achieve fully shredded arms. 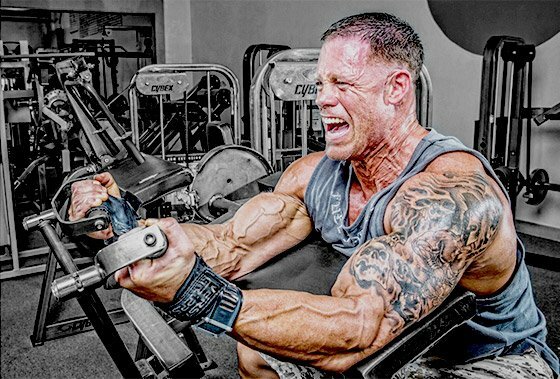 If there's anyone who knows what it takes to chisel strong arms into shredded biceps shrink-wrapped with drain-pipe veins, it's hard-charging Twinlab exec Chris Thompson. 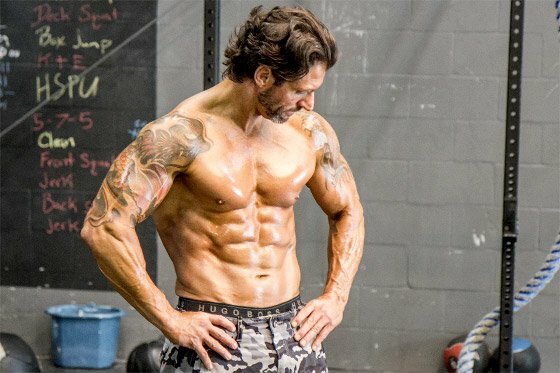 This is the workout he finds a way to get done anywhere, whether it's in a hotel gym on the road, at a Muscle Militia gym invasion, or in the comfort of a fully stacked gym in his hometown. Bear in mind, if you're doing the workouts in a 6-, 9-, or 12-week progression like the Militia suggests, now is when you'll really want to start watching your diet to see all the peaks and valleys come into sharp focus. 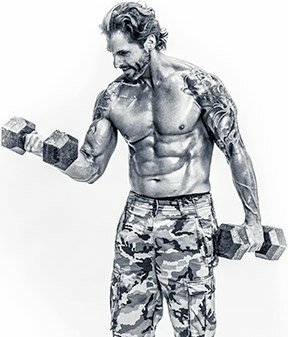 "Bottom line: you have to eat plenty of clean protein, cut carbs, and get in some quality fat if you want to achieve fully shredded arms—or any other body part," says Thompson. But you also have to do the work! Thompson does it with a classic technique known as "running the rack." It's a workout that's devilishly simple and crazily effective. If you're unable to reserve enough dumbbells to make it work, just grab a free cable stack and get ready to ride the elevator to the bottom floor. Pick a weight you can do 15 reps with, so that you're really struggling by the 15th rep. Then move on to the next dumbbell size or pin down, do another 15 (or however many reps it takes to get you to the same struggling point). Keep going until you either can't hit 15 reps with a puny weight, or until your arms really scream, "No más!" Rest one minute, move onto the next exercise, and keep going until you've done all four exercises. For a lot of guys today, looking good means staying in hot pursuit of washboard abs. But as anyone who has achieved those elusive midsection speed bumps knows, success boils down to dieting more than anything else. Puny 99-pound punks can have an ice cube midriff without ever developing enough strength to bench press a bag of dried oats. Even worse, you only get to show off your abs when your shirt comes off. Sure, there are those among us who wouldn't hesitate to roll out into a blizzard shirtless and glistening with baby oil, but there are many more who prefer looking like they could pop the head off a lion no matter what they're wearing. If you've made it this far, we know which one you are. Diet helps that look, for sure, but training earns it—brutal, glorious training. So plug these workouts into your calendar and earn your poster-worthy throwback arms once and for all!